We are a successful family run business and have been operating for over 35 years, specializing in both new and existing residential and commercial roofing. Here to provide industry insights and important information. 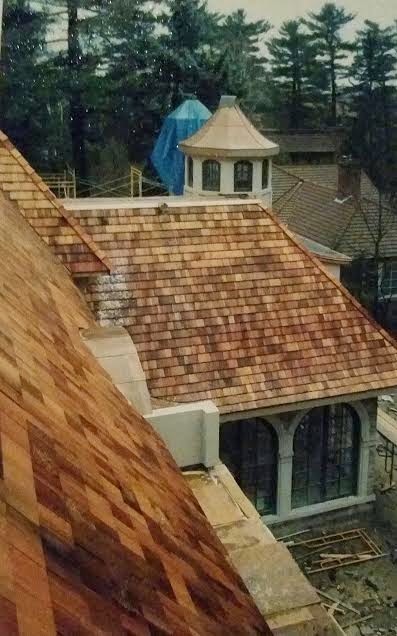 Part of the charm of a wood or cedar roof is the weathered look that comes with exposure to the natural elements. Wood shake roofing is surprisingly resilient to the weather, but it does require proper roof maintenance to enhance its appearance, maximize its effectiveness, and prolong its life. By following few simple steps in the spring, the average homeowner can be assured of keeping a beautiful and efficient wood shake roof for many years to come. Spring is the perfect time for homeowners to check wood shake roofing for damage after the ravages of winter weather and early spring storms. The inspection should take note of conditions like broken or curled shakes, rusted or loosened flashing, and cracked areas around chimneys and joints. These indicate repairs that will need to be made to maintain the integrity of the roof. Likewise, overhanging branches, debris-filled gutters, and moss or lichen growing on the shakes indicate areas where roof maintenance is needed. All of these conditions lead to the build-up of moisture, which can cause erosion and speed up decay of wood shakes. Typically, those repairs require the attention of your local roofer, but simple roof maintenance can be performed by the homeowner who is handy. Tree limbs that shade or overhang the roof retard drying and should be trimmed away. Gutters should be cleaned to prevent blockage and the growth of mold and fungi. Rust that is detected on flashing and other metal surfaces should be removed and treated. Dirt, debris, lichen, and moss may prevent drainage of the roofing surface and retain moisture. A garden hose and a stiff brush should be used to loosen the build-up and wash it away. The homeowner who prefers to leave roof maintenance tasks to a professional can choose additional options for preserving and enhancing wood shake roofing. Power-washing and the application of chemical cleaning solutions, preservatives, and pigmented finishes can add resilience and enhance the roof’s appearance. These treatments require training and special equipment, and, if improperly applied, can erode the shakes and harm surrounding surfaces and foliage. A reputable roofing contractor can advise the homeowner on the appropriate treatments for his roof, and then make sure that those treatments are applied safely.